South Korean President Moon Jae-in on Tuesday arrived in Pyongyang for his third meeting with North Korean leader Kim Jong-un. President Moon's plane took off from Seoul's Seongnam Air Base at 8:40 am (local time) and landed in Pyongyang's Sunan International Airport at around 9:50 am (local time). Hundreds of North Korean people, including Kim's sister, Kim Yo-jong, were seen welcoming President Moon, according to a live feed of the South Korean president's arrival broadcast in South Korea, Yonhap News Agency reported. President Moon is being accompanied by his wife Kim Jung-sook and 110 delegates and staff members, including top business people. An advance team comprising 90 South Korean officials arrived in Pyongyang on Sunday. During the meeting, which will go for three days, President Moon and Kim are expected to provide a breakthrough in denuclearisation talks between North Korea and the United States and discuss steps to further enhance inter-Korean relations. "One (objective) is to continue developing inter-Korean relations, and the other is to promote North Korea-U.S. dialogue aimed at denuclearisation of the Korean Peninsula," President Moon told a group of North Korea experts and special advisers last week. President Moon is scheduled to meet Kim twice in Pyongyang, with their first interaction set to take place after the former arrives in the North Korean capital today. He will also participate in a welcome dinner ceremony that is likely to be hosted by the North Korean leader. On Wednesday, the two Korean leaders are slated to hold talks for the second time, following which President Moon will attend a farewell dinner, before his departure to South Korea. This will be the third meeting between President Moon and Kim and the first visit by the former to North Korea. 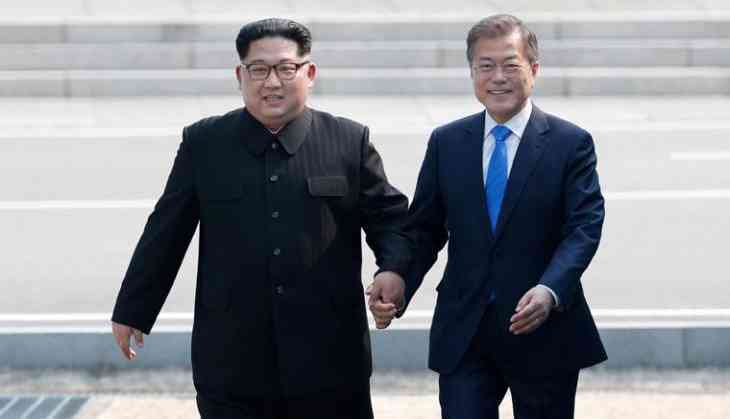 The two Korean leaders had first met at Panmunjom in the Demilitarised Zone (DMZ) in April, followed by the second meeting in May. The historic visit by the South Korean president to Pyongyang comes amid a diplomatic tussle between Pyongyang and Washington over the progress of denuclearisation talks. Last month, US president Donald Trump had cancelled Secretary of State Mike Pompeo's trip to North Korea, saying a "lack of progress" was made in the denuclearisation process. Kim has been reaffirming his commitments to abandon the regime's nuclear development programme and achieving complete denuclearisation of the Korean Peninsula in his previous meetings. President Moon's security advisor Chung Eui-yong, who visited North Korea earlier this month, said that Kim was willing to denuclearise even before the end of Trump's presidential rule in 2021.